Jump To: Page 1: GAMDIAS Hermes P2 RGB Optical Mechanical Keyboard Page 2: GAMDIAS Hermes P2 RGB Optical Mechanical Keyboard - A Closer Look Page 3: GAMDIAS Hermes P2 RGB Optical Mechanical Keyboard - How Does It Stack Up? Founded in 2012, GAMDIAS is a Taiwanese-based company that produces peripherals for the PC gaming market. The DIAS in the GAMDIAS brand name is derived from Greek mythology and is another name for Zeus, the king of Gods on Mount Olympus, while the GAM is short for ‘gaming in motion.’ Interesting marketing and naming schemes aside, GAMDIAS is looking to advance their position within the PC gaming industry by producing quality peripherals and accessories that offer a unique visual appeal. 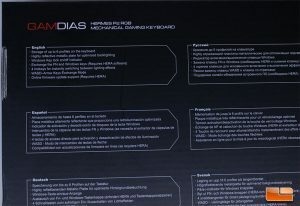 GAMDIAS produces a full lineup of mice, keyboards, gaming headsets and even RGB gaming chairs. 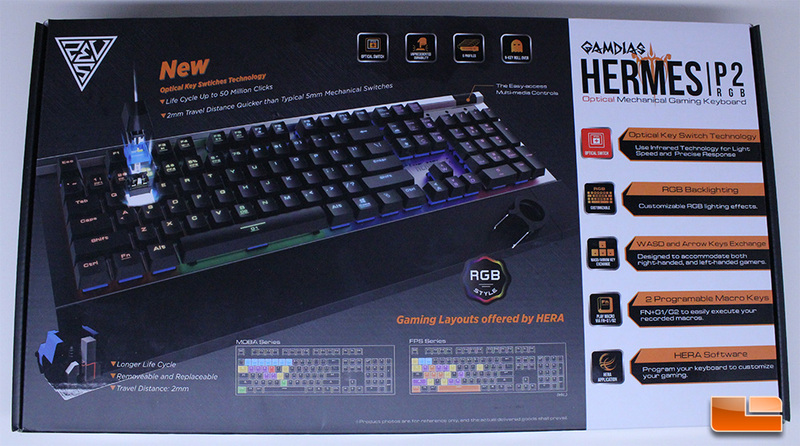 Today, I am looking at the GAMDIAS Hermes P2 RGB, a full sized mechanical keyboard that offers optical mechanical switches in addition to features commonly marketed to gamers like N-Key Rollover and programmable RGB lighting. In Greek mythology, Hermes was the son of Zeus and the messenger of the Gods. GAMDIAS bases their products and marketing around Greek mythology and has a full lineup of keyboards named after Hermes, varying in feature set and price. The GAMDIAS Hermes P2 RGB is fully featured and priced at $149.99 on Amazon, positioning it as a high end enthusiast offering designed to compete with other premium optical mechanical gaming keyboards like the $139 Aorus K9 Optical and the $159 Wooting One. 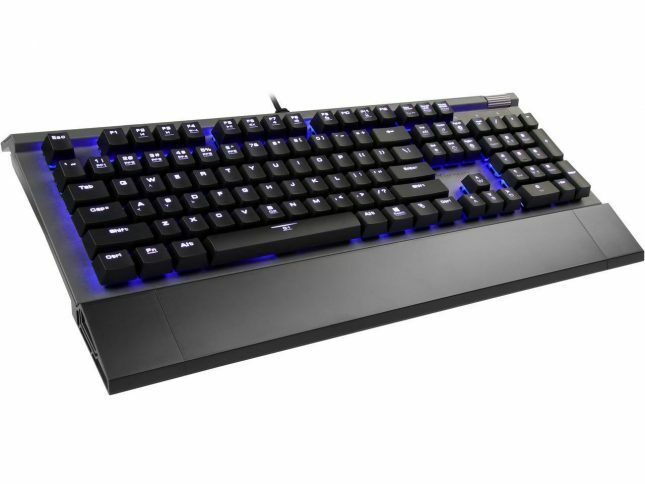 With optical mechanical RGB keyboards priced so closely together and offering features that appeal to gamers, the market is already becoming competitive. Still, Cherry MX RGB keyboards like the recently reviewed GSKILL KM570 RGB are available for under $100, so these new mechanical optical switch keyboards definitely aren’t on the value side of the spectrum and for now are being aimed at enthusiasts who are willing to commit to spending around $150 on a keyboard. 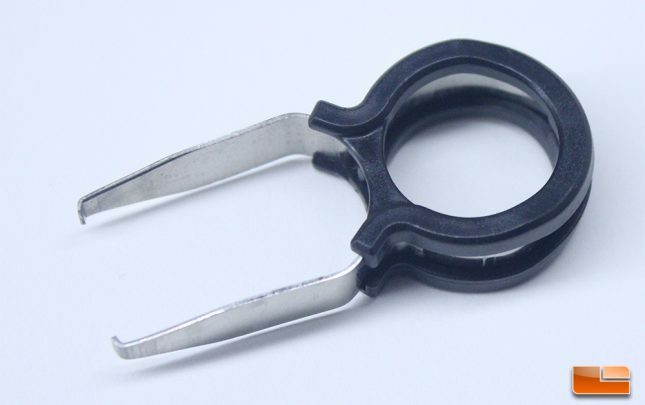 While Cherry MX mechanical switches and clones remain extremely popular with keyboard enthusiasts, recently a few manufacturers began producing competing switches using optical technology. Rather than utilizing metal-on-metal contact for actuation, when an optical switch is pressed it adjusts the amount of light traveling through the switch, which is then read by an optical sensor that determines when the switch has been pressed far enough to let enough light through. Optical switches aren’t subject to chatter or other issues that occur with traditional mechanical switches when the metal wears and because they don’t have small metal parts making up the mechanism, they are able to handle water and dust contact a lot better than their traditional counterparts. All three of the keyboards I have used that feature optical mechanical switches allow for easy replacement of the switch with a simple puller, something you can’t do with your typical Cherry MX keyboard. The ability to replace individual switches is something that I am sure a lot of us with a single defective switch on a mechanical keyboard wish was a possibility. I have had some experience with the Flaretech optical switches on the Wooting One and Aorus K9 Optical, but the GAMDIAS HERMES P2 RGB offers completely different switches that GAMDIAS brands as “GAMDIAS Certified Mechanical Optical Switches.” The GAMDIAS certified mechanical optical switches are from a supplier that I am not familiar with, but GAMDIAS states that they have been tested and validated for a 50 Million key stroke lifetime. GAMDIAS doesn’t offer too much in the way of extensive information on these optical switches, such as the actuation force required or actuation distance. The GAMDIAS Certified Mechanical Optical switches are branded as Blue/Brown/Red/Black to correspond with the Cherry MX switch that they most closely resemble, with the Blue offering a tactile bump and an audible click, for example. With Flaretech optical switch specifications readily available and enthusiasts caring about this information, I do call upon GAMDIAS to provide more in-depth specifications for their Certified Mechanical Optical Switch. I also failed to locate standalone versions of the GAMDIAS Certified mechanical optical switches that would allow a user to replace the switches on their Hermes P2 RGB, a feature that GAMDIAS advertises on the packaging and website literature for the keyboard. I was unable to easily find the warranty length on the GA Hermes P2 RGB from any of the literature online and the keyboard didn’t come with any warranty guides, as I noted earlier. I really like to see forthcoming warranty terms, so GAMDIAS should do a better job of publishing the warranty of their products. Even if you visit the GAMDIAS warranty page, no warranty length is even listed there, so I had to contact support to inquire about warranty length and found out it is one year in the United States. Going through hoops to find out warranty terms on a keyboard isn’t something consumers should have to do, especially when major players like Corsair and Logitech clearly list minimum two year warranties for their gaming keyboards on both the product pages and warranty sections of their websites. 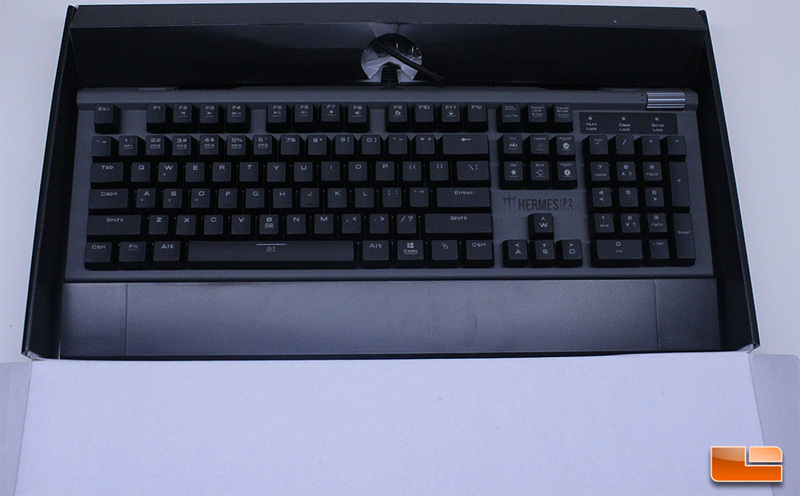 The Hermes P2 RGB is packaged in a quality box with GAMDIAS branding throughout, with the RGB capabilities of the keyboard being noted along with some other features that may be relevant to gamers, like macro support. The box of the Hermes P2 RGB provides some details on the GAMDIAS Certified Optical Optical switches, noting that they have just 2mm of total travel distance. Actuation distance is a very important figure when it comes to the performance of a mechanical switch and this information is nowhere to be found on the packaging of the GAMDIAS Hermes P2 RGB. 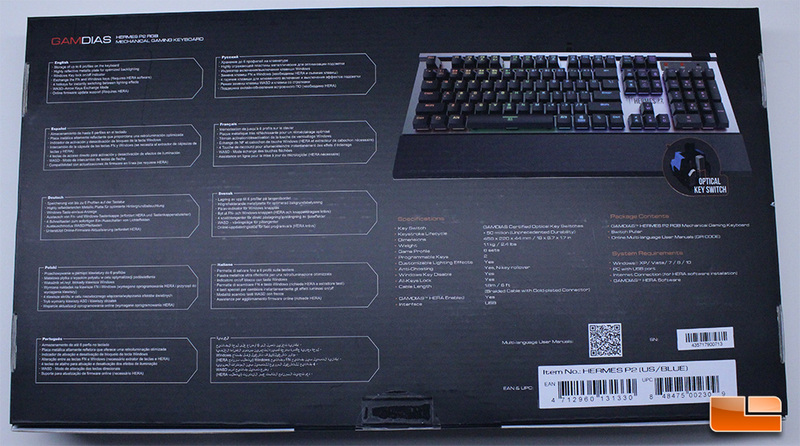 The rear of the GAMDIAS Hermes P2 RGB box lists some specifications and features of the keyboard, along with listing OS compatibility. 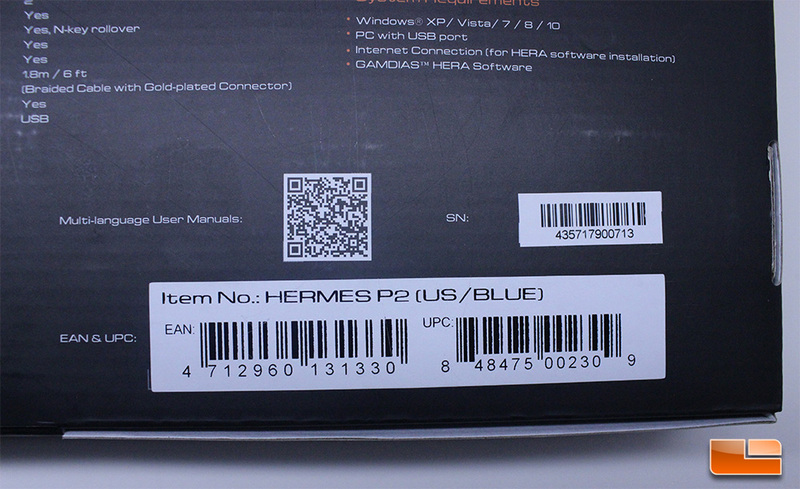 The the type of switch included with the Hermes P2 RGB is listed on the item number strip on the rear of the box, with my sample containing GAMDIAS Blue Certified Optical Switches. GAMDIAS does a pretty good job of presenting the Hermes P2 RGB, noting features that may be important to gamers like N-Key rollover, RGB lighting, programmable macro keys and more. I do think more information on the switches and the technology behind them would have been informative, as optical switches are still new to the market and only available on a few keyboards, so consumers are likely to be very unaware of them and how they operate. Important information like actuation distance and force for the switches would have been excellent to know, as these specifications can factor heavily into a buying decision from a customer who has experience with mechanical switches. 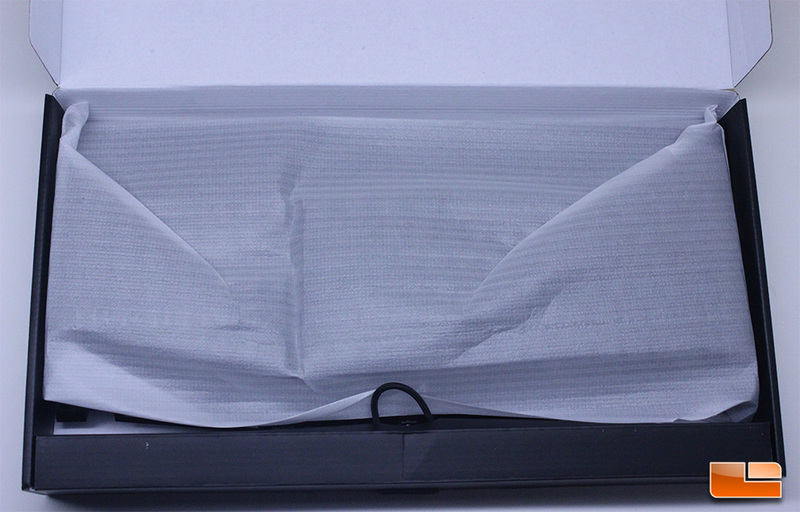 Opening the GAMDIA Hermes P2, we see that GAMDIAS has covered the keyboard with a thin protective fiber sheet which is easily removed to reveal the full sized keyboard and its built-in plastic wrist rest. The inner packaging of the Hermes P2 RGB is absolutely minimal, with no manuals, stickers or other ownership literature present. The cable for the keyboard is wrapped nicely into an upper section of cardboard to keep things tidy. The GAMDIAS Hermes P2 RGB keyboard is packaged well enough and protected, but GAMDIAS definitely kept the paperwork and extras to a minimum. A key cap puller was included with the Hermes P2 RGB, but the puller has sharp metal prongs that can scratch the basic ABS key caps included with the Hermes P2 RGB, so I’d recommend against using it if you want to keep your key caps scratch-free. 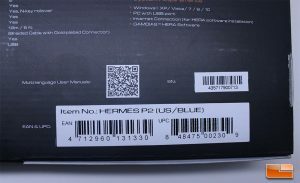 The Hermes P2 RGB has decent presentation and the box is informative, but I feel that some pertinent information was missing. The absence of any paperwork, even warranty literature, was interesting and it didn’t really bother me much, but this is a very competitive industry and most companies included at least a basic manual with their keyboards. The lack of a manual actually had me concerned that my keyboard was incomplete, but looking on the rear of the box, GAMDIAS does state that you are to obtain the manual by using a QC code download. 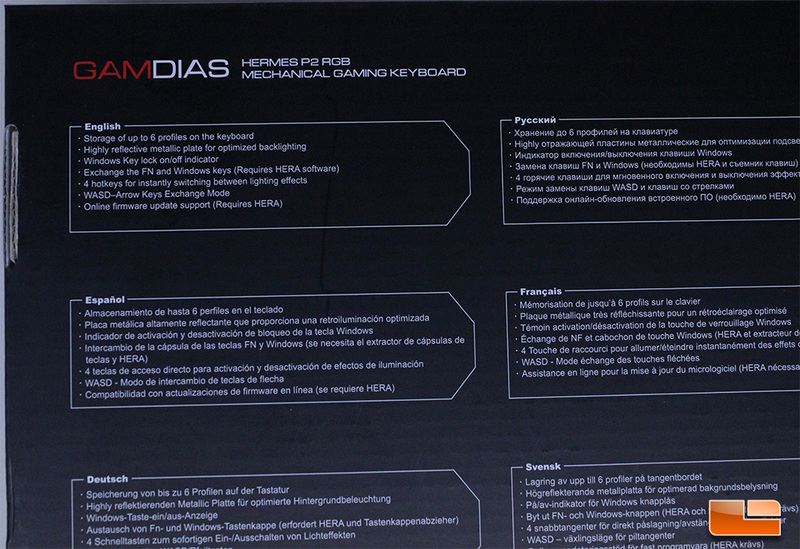 Let’s take a closer look at the GAMDIAS Hermes P2 RGB keyboard on the next page.